The budget airline has launched the #wingsie competition, inviting travellers to post their best plane impressions for a chance to win one of five €100 flight vouchers. It is also posting aircraft models under the #avgeek tag, tapping into an existing community of plane spotters and enthusiasts on Instagram. 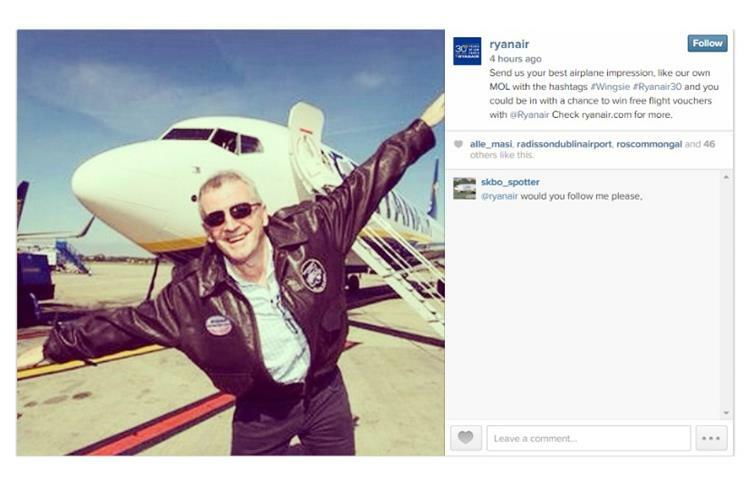 Ryanair is slightly late to the party, joining Instagram well after rivals such as British Airways, EasyJet and Monarch. British Airways is a regular Instagram user, and has been active since April 2011. Monarch signed up more recently in November last year. EasyJet's account no longer appears to be active as of September 2012, but was created in June 2011. An EasyJet spokeswoman confirmed that the airline now sees Facebook and Twitter as its key social channels. Ryanair's communications chief, Robin Kiely, said: "We are already the fastest responding airline on Twitter, while our YouTube videos have been viewed over 3m times, and we look forward to branching out onto other social platforms in the coming months." A spokeswoman confirmed Ryanair's account is an organic, rather than paid-for, activity.